Some of the decisions we make aren’t the right ones. That can discourage us from making decisions in the future. We don’t want to take a stand and be wrong. But if we don’t make a decision, we get stuck. We don’t move. Which means, we can’t grow. We might avoid a mistake, but we also miss a lesson from the mistake. And perhaps we don’t avoid making a mistake after all; indecisiveness can be a mistake. Double-mindedness is wanting two things that can’t co-exist. We can’t simultaneously be on both sides of a fence. We should certainly pause and discern before swinging a leg over to one side of the fence or the other, and that process can take some time, but we can’t get stuck in the process. It’s an uncomfortable position to be in, yet some people find comfort in it. We face choices all the time. I’m not talking about decisions about what to eat, who should drive, and what to wear. (Although ambivalence about these things can be as maddening.) I’m talking about significant choices that impact our next steps. We think, if we delay long enough, we can avoid the choice, have the best of both worlds, or fall into the default. God wants us to be more intentional and willing to engage in the choices we face. Those choices and the way we handle them impacts our faith. They reveal our trust in Him. They refine our hope. They prune our character. Money? Time? Opportunities? Guidance? Healing? Provision? After all, he takes care of all of those areas. But we often go to him telling him what we want or need most, based on what we’re assessing our needs and wants are. We’re actually asking him to give us what we’re certain we want or need when, in reality, he knows what we need more than we do. Our asks are distorted. When we ask for more of God, when we yield to him, when we let his wants determine our wants, we get what we need. We get God. When we let our own analysis of a situation or a relationship determine our asks, we’re assuming our insight trumps God’s. But when we ask for more of God, when we ask him to reveal himself to us, we get to know his character. We’re content in his presence. We find his peace in our chaos. What about praying what’s on our hearts and adding “if it be your will” at the end of each prayer to make sure God knows we want him to filter everything through his will. We don’t want what he doesn’t want. We’re giving it all to him. However, when we’re passionately praying for specifics and simply tacking on an escape clause on the end, we need to realize God knows our hearts. He knows what (and who) we’re seeking. He knows our motivation. If you want God to filter everything through his will, seek to know God more than you’re seeking anything or anyone else. Filter everything through his will as you get to know him through his Word. Ask him questions and watch for the answers. Look for the creative ways he teaches you. Notice him pouring into you when you’re looking…and when you’re not. 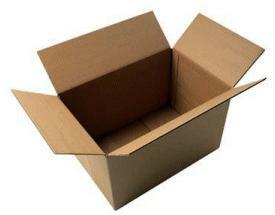 That box you have God in? Open it up and collapse it. Put it in the recycling bin. You’re not going to need it anymore. …until I was in Israel. I was thrilled when I found it. Photos of present day biblical locations are printed on the right side of the pages. On the left side is information about the location. In between is an overlay page, which superimposes how the area likely looked during biblical times. Locations are not only compared side by side; they’re superimposed for a more complete picture. I want the same for my life. I want someone to see me in God’s image. I want him to superimpose his image onto me, so people experience him, not me. I want to yield so completely to him that I am nearly invisible because he is working so extensively through me. I can’t become God (nor do I want to! ), but I certainly want to become like him. He created me in his image, and I’ve been messing it up ever since. I want my first impulse to not be what I would do on my own but what I’d do in him. I want to be so familiar with his character that my reflexive response is close to his response. What about you? How would your life look different if God overlaid his image onto you? How are you going to need to yield to him in the coming days in order to become more like him instead of relying on your own strength, direction and provision? God wants more for you. Whether you’ve been living within his will for years, struggling to get to know him, or turning away from him, God wants more for you. He wants himself for you. 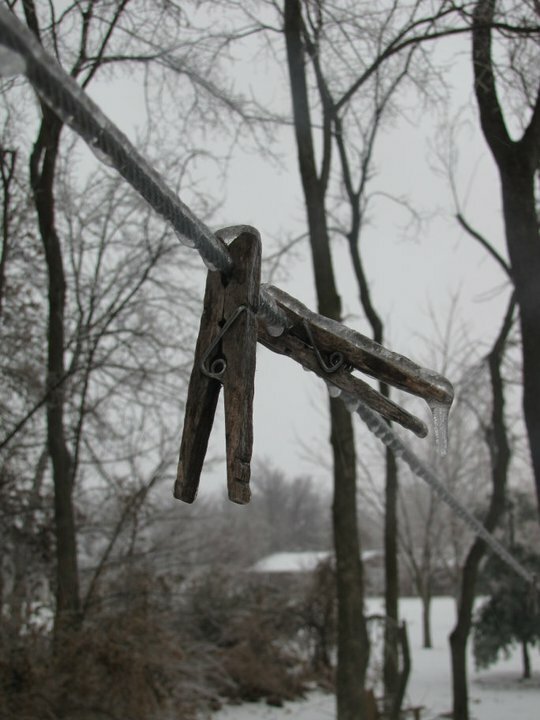 It’s a beautiful photo, but it made me think: “I don’t think that clothespin is going to be able to do a good job of pinning anything for awhile.” While it was hanging around on the clothesline, freezing rain and sleet encased it. Now it’s stuck. Ever feel that way? Unable to move, rendered useless or worthless? 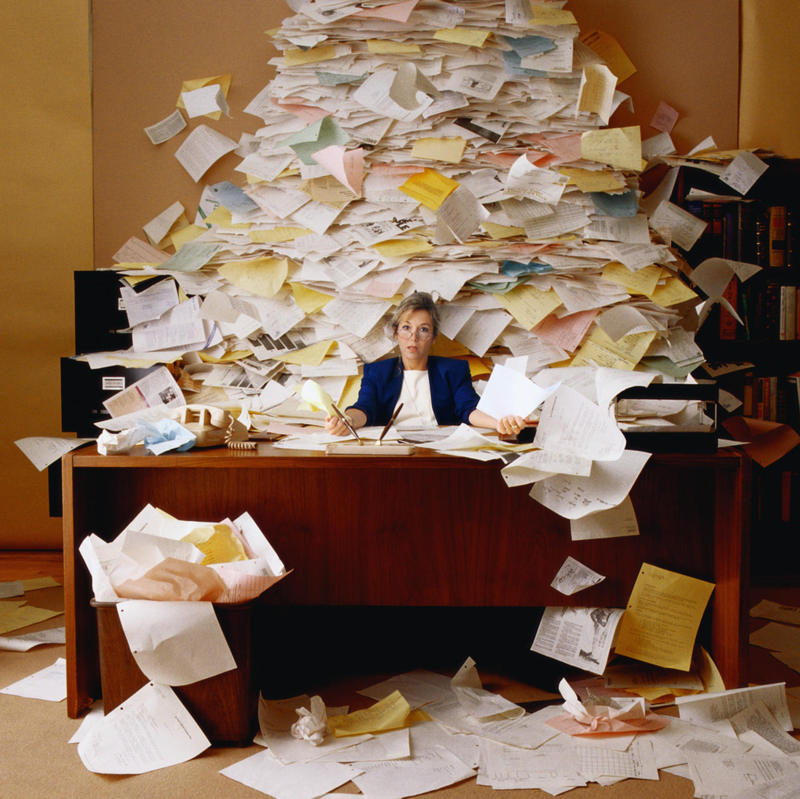 Perhaps you’re overwhelmed with “can’ts.” There’s not enough time, money, talent…the list goes on. Sounds like there is plenty of one thing – excuses! Sure, you might call them “reasons.” I’ve used the same rationale through many seasons of my life, but the truth is, I’m not an inanimate object that gets frozen in ice. I’m not trapped. I have options. I might be too blinded to see some of my options, and I might not like some of my options, but I’m not trapped. And neither are you. You’re not unable to move. You’re not useless or worthless. When we have problems and trials, we can develop endurance. (We can also sit and mope and whine and become self-focused. We can let the ice freeze around us, immobilizing us…and we can even appreciate where we are as “beautiful”!) Endurance develops character. Character develops our hope in salvation. And yet…isn’t it our hope in salvation, our relationship with Jesus, our acceptance and understanding of God’s character, that helps us deal with our problems and trials in the first place? We often stop where we are because we’re waiting on something. We think we need more faith or we need more strength or we need more courage. We may even ask God for it. And then we wait and wait and wait….when we already have what we need! If you have a relationship with Jesus, you have his strength and courage. You may not always feel like you have it, but it’s there. We may feel completely drained and insufficient and incapable, but it’s not because we actually are. It’s often because we’re not standing on the promise of Romans 1:5. The Holy Spirit gives us everything we need. The strength and courage we need is already in us, and not only is it in us, but the Holy Spirit fills us! You have access to God’s love, courage, strength, joy, discernment (and the list goes on…) inside you, accessible at all times. So why would you want to be frozen to a clothesline or sit beside the road, bury your head in your hands and quit? Do you struggle with pressures and perseverance? Here’s an experience to share with your small group or friends. Ask each woman to place graham crackers on a plate in front of her. Each graham cracker square represents an area of responsibility in her life (mother, wife, employee, supervisor, ministry leader, volunteer, board member). Or areas may be situational such as health, finances, or travel. Women will then use icing to write a letter or create a symbol to represent each area the graham crackers represent. For “mother,” a simple “M” will do, or those women who are a bit more creative might design a smiley face with hair standing on end and eyes closed in exhaustion. Next, women place chocolate chips on each cracker to indicate the burden associated with each area of their lives. So, an area which has little burden has only one or two chocolate chips on it, and an area that has overwhelming burden might be overflowing with chocolate chips! Remind women: This might seem like a yummy treat when we look at one or two of our crackers, especially when we think we have the best ratio of cracker, icing and chocolate! But what if you had to eat everything you have in front of you all in one sitting? What surprised you as you were setting up your crackers? What areas do you feel the most weight/burden and why? When was the last time you felt an added burden? A release of a burden? How do you typically cope with pressures of everyday life? How is this experience like coping with the everyday responsibilities and situations in your life? We all start somewhere. And if we aren’t deliberate, we’ll just stay in that same place! Yet these two passages point out perseverance is part of the growth process. In other words, if you stay put, you won’t grow. So, this might seem odd to you. How can we “stick” to something and grow at the same time? Aren’t we trying to learn how not to get caught up in the constantly changing, move-on-to-the-next-great-thing culture? What we need to stick to is not a place or situation. What we want to stick to is perseverance itself. Romans says perseverance produces character, and character produces hope. The situation in this passage involves some type of suffering. Our perseverance isn’t about sticking to the situation causing our suffering. Our perseverance focuses on what will take a through our sufferings and other situations. We stick to perseverance because it’s perseverance which leads to hope, which according to the Bible, doesn’t disappoint us because of who God is! Of course, we don’t know how long our sufferings will last. Perhaps a brief time, perhaps a lifetime. But when we stick our feet into the sinking sand of our sufferings, we’re definitely not going anywhere. When we set our sights on perseverance, we develop character and the hope. And hope carries us through our trials as we grow in our relationship with God. As the passages of James say, we cannot mature without perseverance. Ouch! So, if we’re not persevering, we’re not growing; we’re staying childish. God has a plan and purpose for each of us, but we can only fulfill that purpose if we are growing, which means persevering through trials and struggles! If we refuse to grow up, we can’t begin to accomplish what God has planned for us. In the original Greek language of these verses, the terms, perseverance, character, suffering, and hope, are all entwined in their definitions. How are they tied together in your life?